Children's Hour was an abiding consolation for millions of children particularly during the war years when families were torn apart by evacuation. The decision to end it in 1964 came as a great grief to generations of listeners. It became a national institution. It was one of the most renowned and certainly the most loved of all BBC creations. The Children's Hour people carefully and successfully walked the tightrope between children's wants and children's needs. By the early 1950's, with Derek McCulloch in charge, the programme had produced many talks, plays and drama serials. 1953 saw many programmes broadcast with information preparing children for the Coronation, such as historical series on "The Queens of England" and "In Honour of the Queen", a story about the celebrations for Queen Victoria's Coronation in a North Country village, written by Bertha Lonsdale. There was a Request Week held in spring each year when the programmes were selected by the young listeners. There were regular programmes such as "Jennings at School" and "Norman and Henry Bones" episodes, also Toytown, one of the best loved parts of Children's Hour. 36 stories about the inhabitants of a happy, sunny, carefree land written by book illustrator , S. G. Hulme Beaman. They were first broadcast in the 1930's, and many times since. Felix Felton played the Mayor of Toytown, Derek McCulloch immortalised himself as tremulous Larry the Lamb, Ralph de Rohan was Mr. Grouser and Norman Shelley was Captain Brass. Toytown later transferred to television in the 1950s. Serial Plays were broadcast such as Sherlock Holmes stories with Carleton Hobbs as Holmes and Norman Shelley as Watson (1952). Also single part plays and selected introductory excerpts from books, and features and documentaries, were also produced such as careers programmes like "I Want To Be...". Talks were collected together to be heard on regular days under the overall title of "Talking Time". Music was provided for by programmes such as "Music in Miniature" - a non-stop programme of music and songs. There were also religious programmes broadcast on Sundays and Light Entertainment like "Tinker and Tapp Inc." who were played for several years by Fred Fairclough and Herbert Smith. The long suffering lady who employed Tinker and Tapp was Mrs. Parkinson, alias Violet Carson! On Mondays, the first half an hour was devoted to serial plays or dialogue stories especially for younger listeners. From 5.30pm onwards, the programmes were designed mainly for an older age group and included film and theatre reviews, talks on music and sports. Tuesdays began with programmes for younger listeners, then at 5.25pm, four programmes were given a monthly position - "Toytown", "Nature Parliament", "Children's Newsreel" and Competitions (with results) with a talk to follow. Wednesday was one of the two main serial play days - sometimes accompanied by a story or talk. Between serial plays, there was a regional team quiz called "Regional Round"
One Thursday in each month was a book day when the programme began with the review programme "For Your Bookshelf". 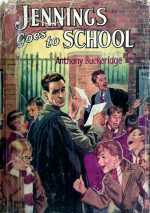 Other Thursday offerings included more Sherlock Holmes' stories dramatised by Felix Felton, further "Jennings at School" episodes with Glyn Dearman as Jennings and Henry Searle as Darbishire. Friday was the other main drama day. Saturday contributions came from London and the Regions. Five programmes were broadcast on a monthly basis - "Cowleaze Farm" (West), "Saturday Excursion" (London), "Clara Chuff" (West), "First Attempts" (London) and "I Want To Be ..." (London). Sunday programmes were generally of a more reflective nature and planned so that the whole family could sit down, without rush or concern, to listen for a more sustained period than during weekdays. The programmes during 1955 contained the established favourites : Biographical plays; historical drama; some stories from Kipling; a repeat serialisation of "The Water Babies"; features on town and country, together with single plays and features, and programmes of verse and music. Each month, too, there was an outside broadcast of a Children's Service involving the Regions, and three more "Cathedral Pilgrimages". 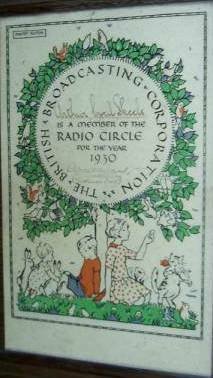 Undoubtedly the Director General and the then Head of Radio expected some outburst from the listening public when they announced, early in 1964 that "Children's Hour" was disappearing for ever as from 27th. March. However they could hardly have expected the barrage of letters, the campaign in the press and elsewhere, the questions in the House of Commons and the feeling of general wrath which greeted the announcement. The programme's untimely demise meant that an important magic casement into Wonderland had been rudely slammed shut. With acknowledgements to "BBC Children's Hour, A Celebration of those Magical Years" by Wallace Grevatt 1988. 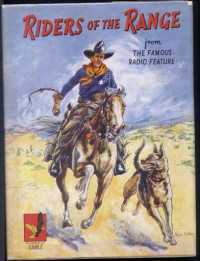 Although not strictly a Children's Hour programme, here is a 1951 Jeff Arnold and the Riders of the Range Annual based on the Charles Chilton radio series.